Sent our girls to school this morning, but Pearl is still unwell after 2 days absent from school, she is down to cough and flu, fever Caused by Throat infection. Doctor put her On antibiotic but We did not proceed to give her, we always try to Avoid letting Our girls taking antibiotic As much as we Can. Today we started giving her antibiotic because home remedies and supplements did not help her to recover as fast. Teacher Asked her to rest at home today. she has been missing school for 3 days this Week..To avoid home works being piled up, daddy has to go to her Classroom to take a snapshot of her homework lists from the board so that she Can do her homework at home. In order for Pearl to rest at home', I decided to take a day off from Work. Following her daddy work schedule will not Allow her to rest well like how it was for the last 2 days. She got to rest at home now while enjoying her favourite VCDs. 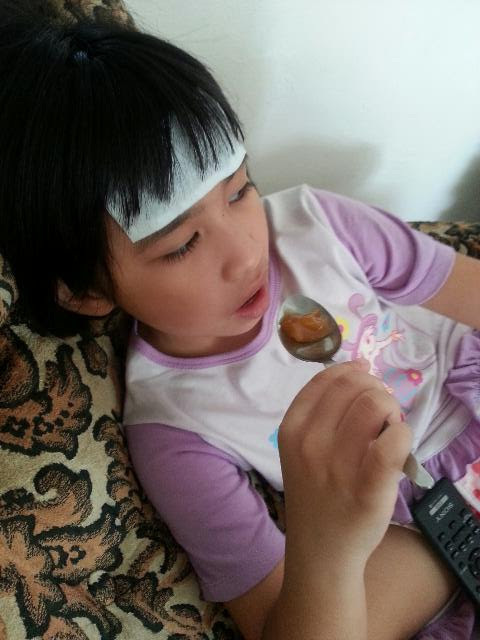 Happy to see that despite being sick and weak she still able to follow the moves on her favourite Hi-5 song. Get well soon Pearl. I hope Pearl is well soon. Let her rest more and take more fluid. She is on antibiotic now, can see some improvement. Hope Aden is feeling better..hope he is coping well with his cough.